Last week FedEx announced that it would add electric V8100 model Chinese-built delivery vans from LA-based startup Chanje. Ten percent of the vans would be outright purchases, while the remaining 900 vans will be leased through Chanje-partner Ryder System Inc. The electric vans are capable of hauling up to 675 cubic feet and up to 6000 pounds of goods with battery electric range stated at 150 miles. Chanje says most domestic delivery routes average about 65 miles in total, making it possible for their vans to run two days of routes without a charge. The benefits to FedEx launching an EV fleet are certainly many, not least among them being an image thing. The company already employs a few hydrogen fuel cell delivery vehicles from Workhorse Group, and this expansion of their ZEV fleet will surely greenwash the shipping giant. Additionally, the company cites decreases in maintenance and fuel costs as monetary benefits to the Chanje vans over conventional internal combustion vans. There is also the added benefit of the vans being much quieter. Getting 1000 noisy and noxious diesel parcel wagons off the road is surely good for the environment in terms of noise pollution as well as traditional. The FedEx Chanje vans, manufactured by FDG Electric Vehicles Ltd—Chanje’s primary investor—in Hangzhou, China, will be used for commercial and residential pick-up and delivery in California. 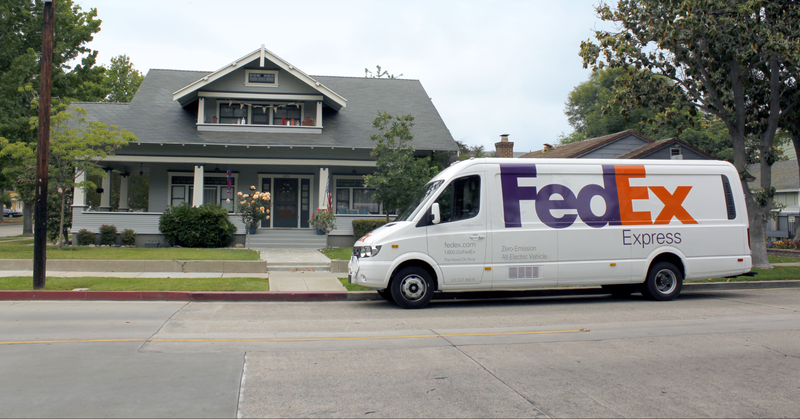 1000 electric vans seems like a lot, but when you consider that FedEx employs more than 60,000 motorized vehicles to move more than 8 million packages per day, the move seems like a small drop in the bucket. For a big company like FedEx, it’s a tiny investment. For a startup like Chanje, it could be the cash injection boost they need to expand their footprint in the world of package (and human) mobility.